Today Healthcare Improvement Scotland publishes its plan for the next five years. I know for most people, a new strategy hardly makes for great bedtime reading. But, accepting I am biased, I believe this is really important and I hope I can convince you why. There are few things as precious to us as individuals, or as a country, as our health and wellbeing. And our plan is all about exactly that: making the care you receive better. One of the graphics I particularly like in the plan is on page 8. It illustrates the huge variety of ways we can support better care. From promoting patient safety, to our inspection and external assurance of care services, and from making sure we use evidence and data effectively to giving people a real say on how care services are designed and delivered. However all of our functions are connected by one thing: supporting better quality health and social care for everyone in Scotland. That is our unifying mission, and this plan sets out how we will go about delivering that right up to 2022. It’s a considerable challenge, but we have the right tools at our disposal, and we have the unique ability to bring them all to bear at the right time, and in the right place, to make a difference. Practically, we can help those who deliver care understand the issues they face through providing the comprehensive evidence they need to make good decisions. We can provide support for improvement that can help advise on the design of services that provide care, and enable changes for the better to be implemented. We are also tasked with ensuring that people have a clear and strong voice in how the care services which they value so highly are provided. Through all of that, we provide the strong assurance and inspection that people expect for care services, which they depend on being there whenever they need them, and operating effectively, 365 days a year. It’s a powerful combination, and I believe it allows us to see how all the various bits of health and social care in Scotland fit together. Not just one piece of the puzzle, but the whole of the jigsaw. I hope this explains why I think this is more than just a strategy. At a time when health and social care is facing real pressures, when it is widely acknowledged we are going through a period of radical change, helping to deliver better care has never been more important. Of course, we can’t make this happen without the support and help of our partners, from those who receive care, to those who deliver care across the country. Indeed, those partners have helped craft this strategy, and we value that input hugely. It is only by further embedding this collaborative work that the difference we want to make will truly be realised. It is the only way we will be successful in making care better. Of course, there are many different aspects to the strategy and it will mean different things to different partners that we work with. Over the next few weeks, my leadership team will be following up this blog to explain how the strategy, and plan for the next five years relates to their area and their stakeholders. Please take five minutes to read the strategy, let me know what you think, and we’ll keep you up to date on the progress we make. (1) This is a welcome plan. In my view it is a sensible and carefully considered strategy. (2) I am concerned that there is not a single mention of ethics within this five year strategy. 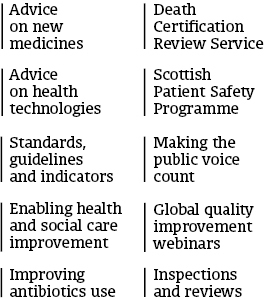 (3) I am not sure why Healthcare Improvement Scotland, which is an NHS Board, requires “branding”. Branding is generally a strategy for commercial enterprises. These are personal thoughts made in my own time. Hi Dr Gordon. We’ll make Robbie aware of your two comments, and we appreciate you taking the time to read the blog and for your responses.